As a city-wide laboratory for architectural innovation and experimentation, Chicago is naturally a world-renowned hotbed for design (and the best architecture tours to boot). Like in any science lab, some experiments will inevitably output more solid results than others, bringing us to 15 of the coolest-designed spaces on our city blocks. As a 24.5-acre rooftop garden built atop an underground parking garage, Millennium Park is a remarkable development in and of itself (it's one of our seven wonders of Chicago, after all). 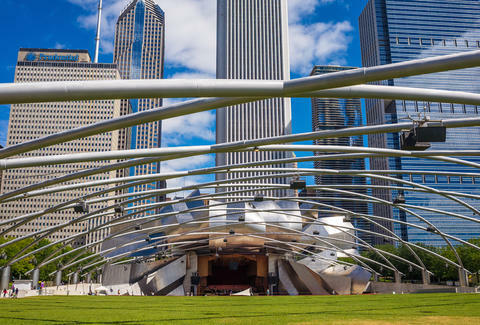 But the park's sculptural music pavilion designed by world-renowned architect Frank Gehry takes center stage. Utilizing $60 million and 870 tons of brushed stainless steel, its billowing headdress stands 120ft high and a trellis of crisscrossing pipes (equipped with a sophisticated sound system) stretches from the stage over the great lawn. The LaSalle St financial corridor structure's name refers to the fondness that pigeons and crows (ravens and rooks) had for the pre-existing municipal structure. 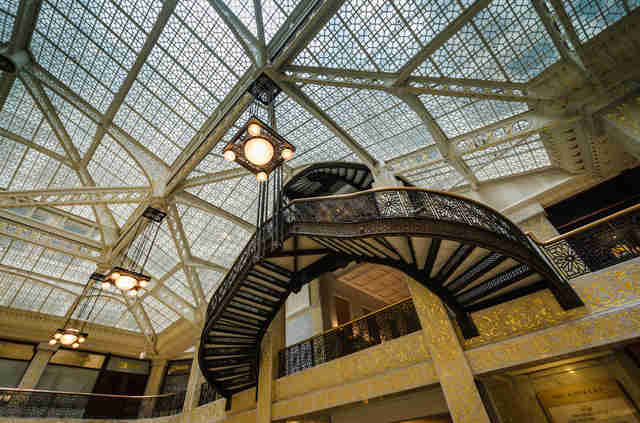 In 1888, architects Daniel Burnham and John Root designed the commercial office space with a stunning, skylit lobby, which maximizes the amount of light and air in the building. An oriel staircase winds down from the 12th floor, connecting the central atrium with the light court at the mezzanine level. The lobby was later renovated by Frank Lloyd Wright in 1907, and is his only surviving downtown project. 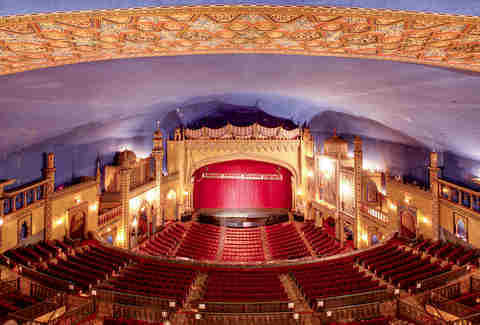 The Loop's 3,600-seat "atmospheric" theater designed by C.W. Rapp and George L. Rapp in 1921 is a magnificent example of the classic American cinema palace. From the off-white glazed terra cotta exterior with the grand marquee to the interior Versailles-inspired lobby, Paris opera-influenced grand staircase, and Louis XIV furnishings, every spectacular inch was considered in the Neo-Baroque French-Revival style. The entire marquee was replaced in 1994 (though it retains the look of its predecessor), and the building underwent renovations in the 1930s, 1950s, and finally a nine-month, multi-million dollar overhaul to save it from demolition in the 1980s (reopening with a gala performance by Frank Sinatra). 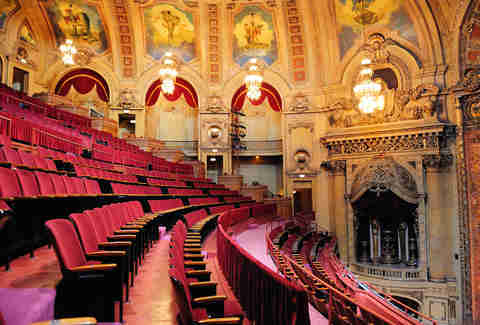 Rapp and Rapp went on to design hundreds of theaters across the country, including others in Chicago like The Riviera, The Uptown, and The Oriental. The delicate structural counterpart to the museum's 1893 Beaux Arts building was designed by Pritzker Prize-winning architect Renzo Piano with a glass-and-steel facade, impossibly slender columns, and a floating roof. 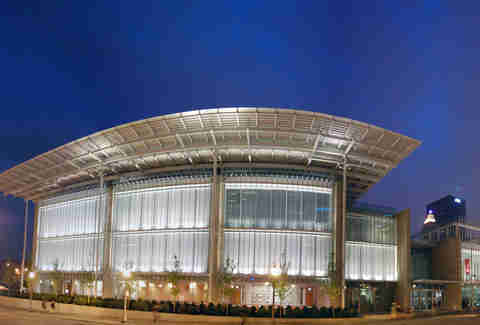 The 264,000sqft Modern Wing is the largest expansion in the museum's history, and put it in the ranking for second largest museum in the nation after The Met. While the wing's east and west facades pay homage to the original structure with limestone exteriors, the north-facing floor-to-ceiling windows offer open views of Millennium Park. A long, whimsical bridgeway connects light-filled galleries of postwar and contemporary art to the park's works across the street. 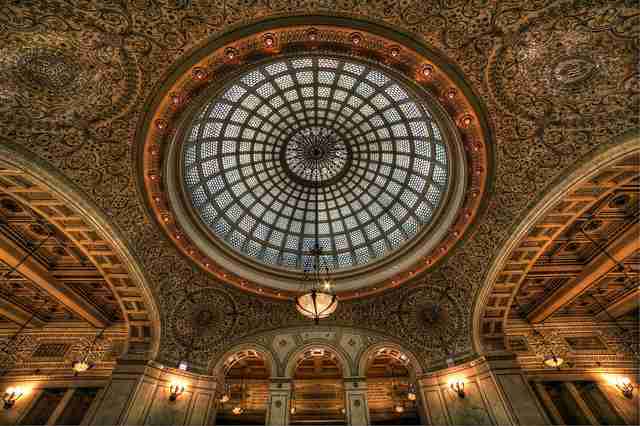 The Beaux Arts building originally designed by Boston architects Shepley, Rutan & Coolidge in 1897 to be Chicago's first public library became the national first free, city-operated cultural center. The marble- and mosaic-filled hub of contemporary arts and culture hosts the inaugural Chicago Architecture Biennial. Preston Bradley Hall’s mesmerizing Tiffany dome -- the world's largest -- measures 38ft in diameter and contains 30,000 pieces of glass, and now shines with newly-restored opalescent color. 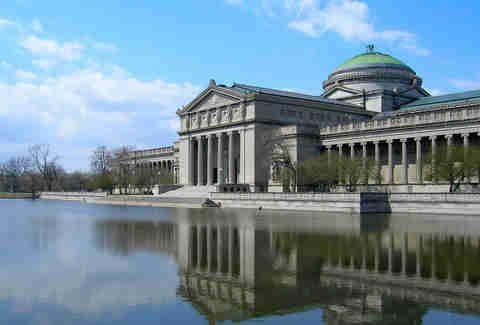 Originally built to establish a strong city-wide reputation of culture and commerce for the 1893 World's Columbian Exposition, the D.H. Burnham & Co.-designed building serves as a gateway to Chicago's South Side. True to the Beaux Arts-style, it's symmetrically arranged in the form of a cross with a large dome rising at its center, and adorned in classical, Parthenon-inspired ornamentation carved into exterior columns. Since 1933, the main entrance's iconic columns have welcomed visitors to more than 400,000sqft of interactive exhibit space at the largest science center in the Western Hemisphere. The boldly postmodern central library for the Chicago Public Library System was built in 1991 by architect firm Hammond, Beeby & Babka, who won the city's 1987 design competition to replace the old library (now the Cultural Center). Drawing from elements of nearby historic buildings, the library playfully incorporates dozens of symbols that salute its architectural predecessors, celebrate its location, and announce its function -- giant owls on the exterior equate to wisdom. An interior architectural highlight, the glass rooftop garden penthouse on the ninth floor, Winter Garden, features abundant, natural light and a perfect space for quiet contemplation in the bustling heart of Downtown year-round. The 2,500-seat landmark theater in South Chicago, which opened in 1927 as the Avalon Theater (renamed in 1987 as a tribute to the original Regal Theater in Bronzeville), was built by John Eberson, a prolific designer of "atmospheric" theaters. Characterized by its exotic, lavish decor, the Moorish Revival-style transported theatergoers into a far-off land of star-filled skies, glistening gemstones, geometric ornamentation, warm colors, and lush gardens. An exterior mural harkens back to its history of notable jazz and blues performers like Duke Ellington, Louis Armstrong, and Stevie Wonder. Closed for most of the last decade with a few exceptions like Open House Chicago, the theater remains a beacon of fantasy with a chance of being revived through holographic performances. 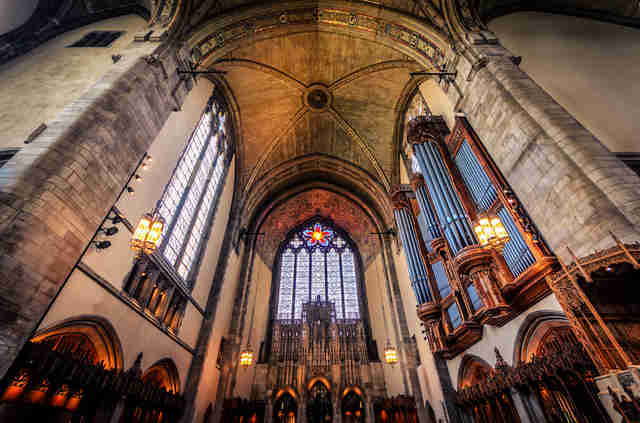 Designed by architect Bertram Goodhue and named for its primary donor, John D. Rockefeller, the Gothic Revival chapel on the University of Chicago campus in Hyde Park stands as the most central and tallest building on campus by covenant. The 1,700-seat structure occupies most of a block, and was built in 1928 without any structural steel. The modernized Gothic style sacrifices some ornamentation for clean lines and unadorned surfaces. In addition to the nearly 70 figural sculptures and interior mosaic work and wood carvings, the chapel contains one of the world's largest carillons (an instrument of 72 musical bells), a sizable Skinner organ, and a carving of the architect holding a model of the chapel itself. The city's sprawling 385 acres of landscaped gardens showcases 2.5 million plants and flowers in a variety of settings year-round. 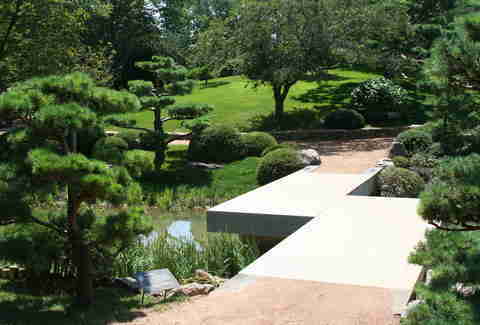 Situated on nine different islands, it features 26 gardens like the Japanese Garden by renowned native garden designer and architect Koichi Kawana, and is surrounded by four natural habitats: McDonald Woods, Dixon Prairie, Skokie River Corridor, and Lakes and Shores. Visionary landscape architects John O. Simonds and Geoffrey Rausch's master plan was the impetus for the architectural design for the gardens, which opened to the public in 1972. For more than 110 years, the landmark Venetian Gothic building designed by Henry Ives Cobb in 1893 housed a historic, exclusive men's club. After nearly a decade of vacancy, Hartshorne Plunkard Architecture and design firm Roman and Williams transformed it into a 21st-century luxury hotel in 2015. 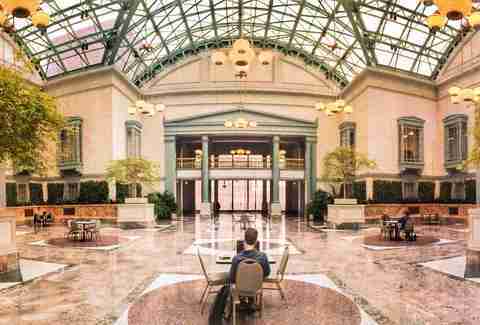 From reinforcing structural columns to carry the weight of a sleek, new rooftop bar and restaurant to fully restoring the old-world craftsmanship to its original elegance, the Michigan Ave mainstay opened to the public for the first time in history. 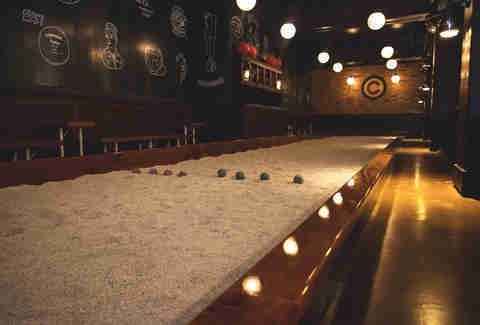 Patrons are even welcome to explore distinctive spaces beyond the exquisitely restored lobbies and array of cocktail bars/game rooms like breathtaking ballrooms and athletic rooms. Forward-thinking architect Bertrand Goldberg didn't think architectural design should include right angles since they didn't exist in nature. 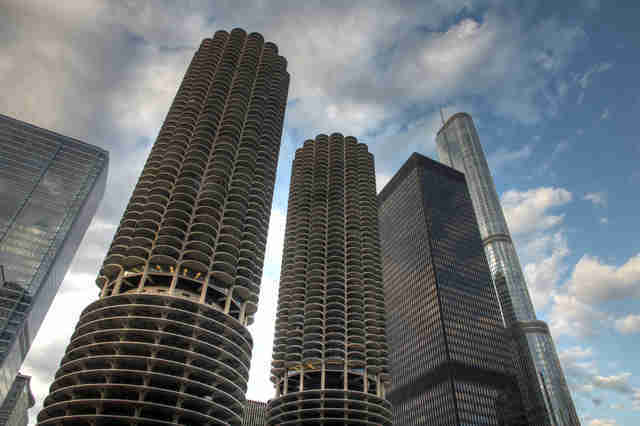 Clearly, his 65-story residential mix-use towers resembling corncobs reflected this belief. The bays radiate from the buildings' strong central cores, so each wedge-shaped unit boasts stunning balcony views. A "city within a city," the complex included two residential towers, plus an office building, theater, retail space, and parking for residents' cars and boats. His experiment in urban living in the 1960s has led to many residential mix-use developments attracting people to live and work downtown today. 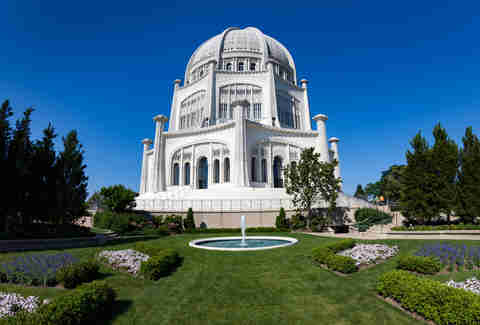 One of only eight in the world, the North American temple (also known as "Mother Temple of the West") is the largest and oldest surviving Bahá'í House of Worship. The fascinating structure on the Lake Michigan shoreline is made of white cement concrete cladding with clear and white quartz aggregate. The nine-sided building's most decorative element is its exterior tracery on the towers, which are intertwined with well-recognized symbols of many world religions. While construction began in 1921, the prominent Chicago landmark wasn't completed until 1953 because of the Great Depression and WWII. It's now open to the public every day of the year. Did you know that pedestrian tunnels run under the Chicago River or why the river flows backwards? Starting at the river level, catch up on the city's history from inside the five-story DuSable bridgehouse on Michigan Ave. Crowned by an urn and a pyramidal roof above an emphatic cornice, the bridgehouse on this famous trunnion bascule bridge is a distinctive feature of the city's infrastructure. Get 360-degree views from the embellished Beaux Arts tower and a behind-the-scenes look at the massive gears that power the movable, double-decker bridge designed by Edward Bennett in 1920. In 2009, architect Jeanne Gang and her firm, Studio Gang, created an aesthetic for a functional skyscraper that put her on Chicagoans' architectural radar. The tallest building in the US designed by a woman-owned firm is a modern box surrounded with slow-rippling, white concrete (inspired by Midwestern limestone) balconies that give it a sculptural quality. The planet-friendly skyscraper's wave-shaped balconies are even arranged for each unit to view at least one of six sites: Oak Street Beach, Navy Pier, Cloud Gate in Millennium Park, the Lake Street "L" tracks, the park in Lakeshore East, or Buckingham Fountain in Grant Park. Nicole Bruce is a contributing writer for Thrillist. She wouldn't mind balcony views of the beach or The Bean, but window views of the brick building next door will have to do for now. Find her on Twitter at @nicoleabruce.